Bil of Material BOM should contain – name of component (e.g. ~R1) / value (e.g. ~10k) / package name (e.g. 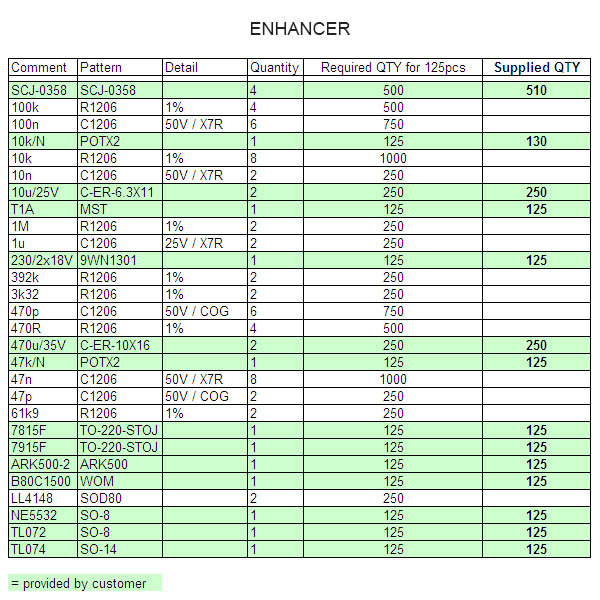 ~QFN20) / quantity (e.g. ~100pcs). BOM should be provided in XLS or ODS format. Detail BOM will improve the data processing. Sample BOM is listed at bottom of this page. In case of delivery of alternative component against the original one listed in BOM please mark this modification in current submitted BOM. In case of mixed component supply (amset / customer) it is necessary to indicate in BOM which components are provided from amset and which are provided by customer. In case of SMT components provided by customer please add a small reserve. There is a small waste during the setup of feeders and assembly itself so we do recommend to deliver few more pieces especially with small components. Other vise some boards can be assembled incomplete. The minimum reserve of passive components (R/L/C), sizes 0603-1210 and discrete components up to 4mm is about 20pcs, or for larger quantities over 500pcs about 3% of total batch quantity. The minimum reserve for passive components (R/L/C) sizes 01005-0402 is 40pcs, or for larger quantities over 500pcs about 4% of total batch quantity. The minimum reserve for other components above 4mm (IC, D,T, …) is about 5pcs, or for larger quantities over 500pcs about 2% of total batch quantity. There is no need to have some reserve of large ICs, connectors and other large components. In spite of this we do recommend to deliver 1-2pcs more. Especially with the BGA, QFN / DFN, packages, where mounting after the boards are soldered is more difficult. The remaining quantity of the components after assembly will be returned to customer.